If you’ve got the Boston song “More than a Feeling” in your head right now, you’re not the only one. It’s been running through my head the whole time I was writing and I couldn’t title the post anything else! I read C.S. Lewis’ book Mere Christianity a few months ago. It is one of the most insightful and thought provoking books I’ve ever read. I am still digesting passages and thoughts that he so clearly stated. It’s absolutely wonderful. If you haven’t read it, I highly recommend it. I love this, both for what it teaches about love and marriage, which is wonderful, and what he uses this example to continue to teach us. His point is that emotions are fleeting and that lasting commitments are based on more than just emotion, but on knowledge, habit, and commitment. He goes on to tell us that what has converted us to become Christians may have been feelings, but we need to seek out the knowledge, habit and commitment that leads to true conversion. “A testimony is the beginning of and a prerequisite to conversion unto the Lord. A testimony is a point of departure; it is not an ultimate destination. A strong testimony is the necessary foundation upon which conversion is established. A testimony is the initial step on the pathway of ongoing and deepening conviction. Laman and Lemuel are great examples of having moments of testimony, but never achieving true conversion. They had many instances where they saw miraculous things or felt incredible feelings. They often obeyed or repented after those things occurred. However, their constant need to have those grand things for them to repent shows that their moments of testimony did not ever transfer to the true conversion that was had by brothers Sam, Nephi, Jacob and Joseph. Alma the younger, as discussed in this blog post, is a great example of how he turned his testimony into true conversion. This principle is true of the Holy Ghost as well. The Holy Ghost is exciting when we start learning what it feels like. We rightly search after that feeling. But as our relationship with the Holy Ghost matures we will find there is a difference and excitement that comes with feeling the Holy Ghost in its intense initial flashes and how he interacts with us when he is our constant companion. I’ve noticed in my own life that as he becomes a more constant companion he doesn’t have to go to the extremes of emotion to get your attention. Thank goodness. I don’t want to be on that roller coaster of emotion constantly. He is quieter, more steady, but is able to bring a greater amount of power and peace. If we are constantly looking for those flashes of intensity and fail to recognize that our relationship with the Holy Ghost has to mature we may not see his hand in our lives and think we no longer feel the Holy Ghost and and we will lose our way. 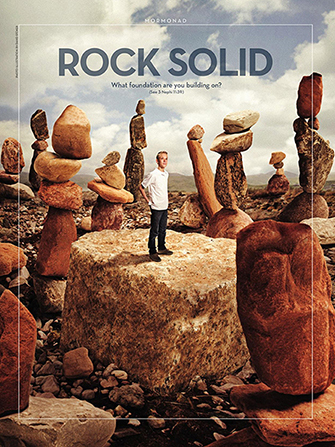 We are taught in 3 Nephi 14:24-27 (among other scriptures) about a wise man who built a house on a rock that withstood the floods and winds and rains and a foolish man who built his house on the sand and it was washed away by those elements. But guess what, they both built houses! They both had testimony. Only the wise had conviction. Those brilliant moments of spiritual clarity we receive are so important to building our spiritual foundation. However, if we rely on the feeling received and not on the knowledge gained in those moments we will find ourselves lost in moments where things aren’t so clear. Our conversion is necessary not for when things are clear to us, but when things are muddled. When the way before us isn’t clear. When we feel surrounded by fog. Our conversion and knowledge needs to be deep enough that even when our emotions, which are very susceptible to influence from outside sources, are confused, we are not. We need to be built on a firm foundation of conversion. 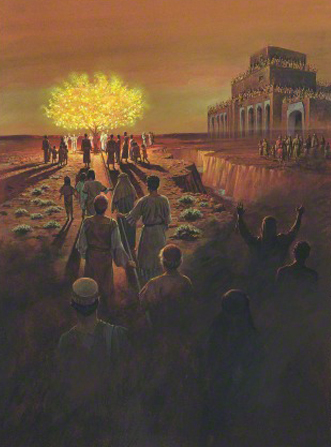 Have you ever thought about why in Nephi’s vision the way to the Tree of Life there was both a narrow path and an iron rod? I mean, shouldn’t a pathway be enough to follow to know the way to the tree? It seems obvious that all we have to do is follow it and we’ll get there. But again, there were outside sources that pulled them away and only those who were continually and firmly holding onto the iron rod made it. They knew the way from two sources how to get to the tree of life. Testimony and conviction are the two sources that we need to be on the pathway to returning live with our Heavenly Father. Testimony alone is not enough. We need to be truly converted unto the Lord.